While some of the ideas that follow may seem a bit trendy, it’s never hurts to model ways to interact with all this new media as a covert way of teaching digital literacy and citizenship. The great news is, you don’t need every student to have a device to make these happen. Heck, in most cases all you would need is a single smart phone. All you need is an open mind and some student-led creative thinking. Those clever little graphics are appearing everywhere from Popular Mechanics to Cosmopolitan. Why not make one as a way to help visual learners review and remember information? Depending on your grade level, this might be harder than you think. Even in a 1:1 district we still print or have need to print things from time to time. The idea behind this challenge is see if you can figure out ways to make things more digital. Maybe instead of a newsletter you print and send home, you write a blog or send a MailChimp? Or instead of asking kids to write and peer-edit each other’s papers, you ask them to share a Google doc? 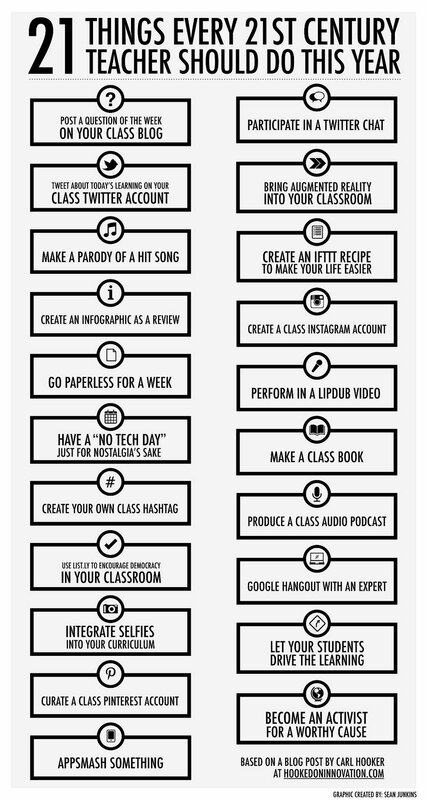 If your students don’t have devices, then challenge yourself to try this personally for a month. And then have your students blog about the experience. 8. Create a List.ly list to encourage democracy in your class. It could be as simple as a list of choices for a project or something as grand as what is one thing you want to learn about this year? Whatever the choice, use List.ly to create a crowd-sourced voting list and let your students have some say in their learning! Pinterest is a great visible way to curate resources but why not create a class account that has a different board based on projects throughout the year. Add students as collaborators and let them post their projects to the board. You could also have a board on gathering resources and information for a topic which would be a good time to mention what is and what isn’t a valid resource? Besides just fun to say, you should definitely take multiple apps on whatever device you use and smash them together into a project. Check out this post for the basics and remember, it doesn’t have to be you who is doing the smashing. Let your kids come smash too! Twitter can be like drinking information from a fire house at times, but finding a good twitter chat on a topic and participating can be a great way to learn and grow as a teacher. Check out Cybraryman’slist of twitter chats and times to find one that interests you. Don’t see any you like? Make your own!Remember in step #7 when you created your own class hashtag? Why not make take an app like Aurasma and hide some easter eggs around your room? You could make them about a project or just secret nuggets about you. It’ll keep kids (and parents during back to school night) engaged and turn dead space in your classroom into an interactive learning opportunity. Need some ideas? Check out Lisa Johnson‘s List.ly List (Remember, you know how to make those now from #8!) of over 50 Augmented Reality apps. With all of these tools and social media platforms, it might be a good idea to create some ways to automate tasks in your classroom. IFTTT.com has some great pre-made “recipes” to combine some of your accounts into simple workflow solutions. You can even have your plant email you when it needs water. This sounds a lot scarier than it is but essentially think of playing the game 20 questions with another classroom somewhere in the world. Here’s a link to a community page with more resources. It’s a great way to increase cultural and global awareness and you could event invite the other class to add to your Pinterest board (#10), vote on your List.ly (#8), comment on your blog (#1) or maybe co-collaborate on an eBook (#16). Have students create a podcast highlighting classroom activities, projects or students. To get it to the web quickly, post it to Soundcloud. For the more advanced user, use a podcasting site likePodbean.com and actually get the podcast posted to iTunes. That way mom and dad can listen to the weekly recap while going on their evening walk or driving to work. With so many resources and experts available, it only makes sense to bring in someone from “the real world”. This not only creates interest in the topic, it adds an air of authenticity. Using Google Hangouts On Air means you can record this session on the fly and post it to your class site or embed it on your blog to generate discussion at home. If the ALS Ice Bucket Challenge can teach us anything, it’s that sometimes a little creativity is all you need to awareness to a cause. Whether it’s helping a country in need or finding a cure for a disease, our new connected society can be a powerful thing when galvanized for good. Participating in a global project gives students perspective on their own lives while helping others with their own life challenges. Just be sure you blog about it when you are finished as learning in isolation helps no one. 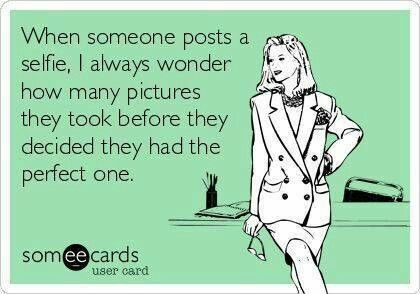 Oh….and be sure to hashtag it. Update: Thanks to Sean Junkins who made this great little graphic for the challenge. Collaboration at it’s finest!